There's nothing quite as romantic and enjoyable as a beach holiday with someone you love and for families looking for a holiday everyone will appreciate. Our beach tour takes you to some of India's most secluded, unspoilt and unexplored beaches as well as the most popular ones in Goa. Here you can relax, sunbathe, get Ayurvedic massages and enjoy the many water sports available- and of course try the delicious sea food. We start the tour at the famous Kovalam beach before travelling to Kanyakumari where you can watch the sunrise and sunset from the same spot! We then spend the last few days on the famous beaches of Goa and spot dolphins off the coast. Arrive Trivandrum. Transfer to Kovalam (16 Kms). Rest of day free to relax. Overnight in Hotel. Kovalam offers you some unique beaches in the range of colours from white to black sands. 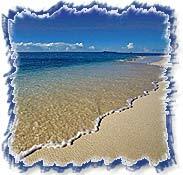 Its palm-fringed beaches enchants you and enhance the pleasure in your life. The beaches that expectedly waits you are : Samudra beach, Aluwa beach, Lighthouse beach and Ashok Beach. 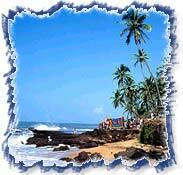 Today Kovalam beach is known as the "Paradise of the South". With high rock promotory and a calm bay of blue waters, this beach paradise creates a unique aquarelle on moonlit nights. It is warm and clean by the coconut trees and the white sand bed as the seabreeze gently plays with the waves. Swimming and bathing are very refreshing and exhilarating in the waves. Most of the visitors like to have a sunbath here. Morning drive to Kanyakumari, (72 kms / 1½ hrs). 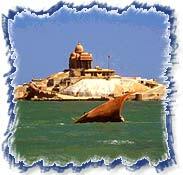 Visit Vivekanada Rock, Kanyakumari temple, Gandhi Memorial etc. Evening watch sunset at the beach. Later drive back to Kovalam and check into hotel. Today drive to Varkala (80 kms / 2 Hrs). Enroute visit Trivandrum- Ananthapadmanabhaswamy Temple, Kaudiar Palace, Napier Museum, Sree Chitra Art Gallery etc. The mineral water gushing from the hill is believed to have medicinal properties. The Varkala sands has become an ideal spot for confluence of cultures exotic and alien. Varkala also houses a leading pilgrim centre in Kerala. The 800-year old Janardhana temple, dedicated to Lord Ayyappa and Hanuman, atop the hill has brought a sobriquet for the region, Southern Kasi (Benaras). Transfer to Railway station / Airport to connect train / flight for Goa. Enjoy your holiday on the beaches like Vasco Da Gama, Bogmallo, Majorda, Colva, Benaulim, Varca, Cavelossim, Mabor, and Palolem. For cultural freaks there are ancient temples like Shri Chandreshwar Bhutnath Temple, Shantadurga Temple, Chandranath Temple, Damodar Temple, Mallikarjun Temple, and many others.